The Republic of Rumi Blog: 6. Zafar, a constitutional monarch? 6. Zafar, a constitutional monarch? 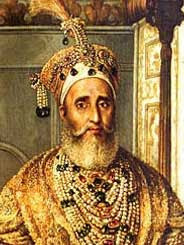 By 1846 AD it became very likely – almost certain – that the ruling Mughal Emperor Bahadur Shah II (better known by penname Zafar) was going to be the last. The British had announced that the dynasty would have to vacate the Red Fort, now its only possession, at the death of Zafar. Repercussions of this announcement seem to dominate the sensibilities of the Indian society, especially the Indian Muslims, through the next twenty years. The first ten, leading to the “mutiny” of 1857, resonate with anxiety. The next ten resonate with the aftermath. Technically, Zafar was a constitutional monarch but unlike in the West, the laws which curbed the power of the king were enacted by foreigners. This made Zafar the least powerful king of his day but it also meant that there was no grudge between him and his people because the curb on his power had not come from them. Thus he was also, in a way, the last “absolute monarch” of history because whatever respect his people held for him was untainted by any haggling over constitutional rights between them and the king. Also, the respect was also unmixed with fear since Zafar had no power over them except the power of his poetry. He was also a connoiseur who held regular poetry recitals at his Fort and thus facilitated other poets to disseminate their work too. Had it not been caused by foreign invaders, a situation such as this could have been the realization of the ideal presented by Mir Amman in Bagho Bahar – an ideal which had been evolving in the conscience of the people for quite some time now. You can listen to this ghazal of Zafar online at YouTube, read his poetry at Allama Iqbal Urdu Cyber Library or find out more about him at Wikipedia. Next Installment: Sir Syed: an introspection.